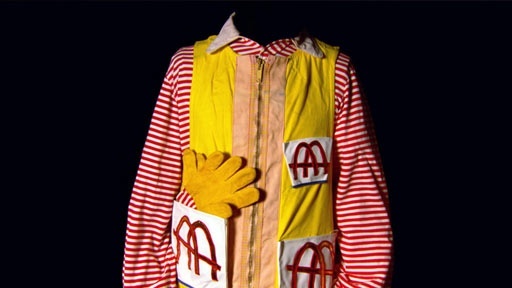 Have we found the original costume that launched Ronald McDonald? The label credits a well-known costume designer, and the costume looks similar to the suit we see in an early Ronald McDonald commercial: the yellow balloon coverall, red and white striped shirt and long stockings, and red oversized shoes. But there are also some curious differences. History Detectives consults with a food and social historian, meets McDonald’s first Chief Marketing Officer, and finally speaks with the widow of one of the first Ronald McDonald clowns. Also with Elyse Luray Crazy Horse Photo Is this the only photograph of a Native American legend? Also in Season 9 World War II Leaflets How did this scrap of paper help change the course of World War II?